The Japanese Graduate Alumni Association of Sri Lanka (JAGAAS) launched a special 60th anniversary commemorative volume A Journey in Harmony: Sixty Years of Japan-Sri Lanka Relations featuring contributions from academics on Japan - Sri Lanka relations as Sri Lanka and Japan commemorated 60 years of diplomatic relations. The launch was held at the Bandaranaike Center for International Studies (BCIS) on December 21 with a gathering including ambassador Nobuhito Hobo, External Affairs Ministry Secretary Karunatilake Amunugama and JAGAAS president Merrick Goonaratne. 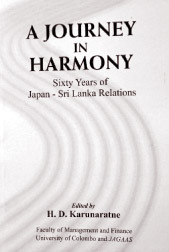 A Journey in Harmony: Sixty Years of Japan-Sri Lanka Relations is edited by Colombo University Management and Finance Faculty Dean Prof H D Karunaratne who is also the JAGASS Secretary. Contributors for the volume are Prof H D Karunaratne, Dr Saman Kelegama, Prof N S Cooray, Dr M S Dassanayake, Dr. Kumudini Dissanayake, Dr K A S P Kaluarachchi, Prof Dharma de Silva, Dr Mangala de Zoysa, Dr Makoto Inoue, Prof A M T P Athauda, Dr Mohamed Esham, Dr Thilak T Ranasinghe, Prof Patrick M F Ratnayake, Tomonari Kuroda, Dr K Kumarasinghe, Dr N N J Nawaratne, Vidya Abhayagunawardena and Ruki Salgado. The book was reviewed by University Grant Commission member Prof Sampath Amarathunga who is also the Dean, Faculty of Management Studies and Commerce University of Sri Jayawardenapura Sri Lanka at the book launching ceremony. JAGAAS was established 20 years ago. The association provides a forum for interaction among those who have completed their postgraduate studies in Japan. JAGAAS members are drawn from the academic community as well as the state services and business sector. JAGAAS has been in the forefront of promoting and enhancing linkages between Japan and Sri Lanka in the cultural and socioeconomic spheres.